How to weigh the costs and benefits of cloud migration for businesses. Many businesses have heard of cloud migration, and many more have begin transitioning some of their services to the cloud. However, others are reluctant to begin the move. The systems they have in place serve them well enough, and moving to something different opens the possibility of a misstep. On the other hand, failing to take advantage of a new opportunity could leave a business behind their competitors and with fewer options for success. Cloud migration carries both costs and benefits. Weighing them against each other is the best way to make the best choice for your business. Depending on what systems you move to the cloud, your IT team will have to devote a certain number of resources to making the switch happen. Beyond this, most cloud services operate on the Software as a Service (SaaS) model, meaning businesses pay for them as a subscription. The move isn’t free, but is likely to be less expensive in the long run. Possible disruption during initial move. Almost every change brings with it some hiccups. It’s possible that your transition to the cloud will be seamless, but like every move, it’s more likely that your team members will experience a few disruptions and have a few adjustments to make. Preparation and good planning can cut down on most of these experiences, however, and prevent them from interfering with customer services. Training personnel is part of any business. Every new employee will have a learning curve as they learn the ropes of the new business process and culture. Similarly, upgrades to hardware and software also take time as employees learn how to use the new interface and incorporate it into their work process. Moving to the cloud is no different. Scales to match company growth. Growing an IT system along with a business is one of the main hurdles many organizations face as they expand. Acquiring new hardware and growing network infrastructure costs more than money. It also takes time to buy new equipment and set it up. Cloud services, on the other hand, are able to scale instantly, simply by upgrading a plan. 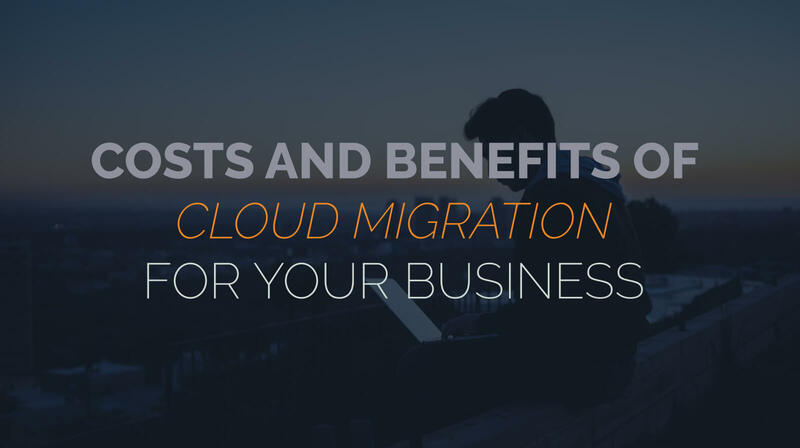 While moving systems is never free, the costs associated with cloud migration are relatively minimal, when compared to the capital expenditures require for investing in new hardware, software, or infrastructure. While these upfront CapEx costs do balance out when spread out over the life of a system, the resources they eat up at the beginning of a project can limit an organization’s ability to take advantage of emerging opportunities. Avoid the cost of maintaining internal systems. One of the expenses businesses often fail to account for when they calculate the costs of their hardware and software is that of maintaining the systems over time. Beyond the up-front investment, businesses also have to consider the costs of updates, of repairing hardware when it degrades, and of security, monitoring, and backups. However, cloud systems take on the maintenance costs. Backend repairs to infrastructure or hardware improvements are covered by the cost of services, as are those of securing the system and providing backups. Greater resilience with reduced redundancy. Speaking of backups, ensuring system resilience can be expensive. It often means investing in extra hardware, so that it can be immediately put to use in case of a failure. While this can be a critical step for many companies who can’t afford downtime or data loss, it’s an expensive system to maintain. However, cloud computing takes advantage of economies of scale. By taking on the cost of system resilience and distributing it across multiple companies, it means businesses save resources by sharing the cost of these redundancies between them. Improved collaboration with remote workers. Finally, cloud computing improves the abilities of remote workers to collaborate with each other. Because all can access the same data and use the same resources, they have fewer problems with poor file access. Cloud computing allows co-workers to edit documents simultaneously from other parts of the world, log in to view the same analytics data, and communicate seamlessly on projects. Furthermore, with companies sharing access remotely, they don’t have to invest in the same infrastructure in multiple locations. Instead, their remote teams are more mobile, allowing organizations to open new branches quickly and with lower risk. The costs of cloud migration are few, and the benefits substantial. While cloud computing isn’t risk-free, what risks do exist are minimal. Furthermore, by migrating to the cloud, businesses eliminate many of the risks posed by their current systems. Maintaining a server rack in an office leaves a business vulnerable to physical threats such as flooding or fire, and can even pose a security risk unless access to the server is carefully controlled. And even if the server stays secure, loss of power could also lead to unexpected downtime. Meanwhile, cloud systems not only help an organization stay agile, they exploit economies of scale to help businesses save resources. Businesses can make significant gains by making the move to the cloud. In fact, many businesses may soon lose the option of doing it any other way. As cloud solutions gain in popularity, the providers of new IT technology are investing in creating more cloud-based resources, and letting their old programs fall by the wayside. By making the migration to the cloud now, organizations stand a better chance of keeping ahead of future developments. If you would like help migrating your IT assets to the cloud, we can help. Contact us, Managed IT Ann Arbor today for a free network assessment to get started.